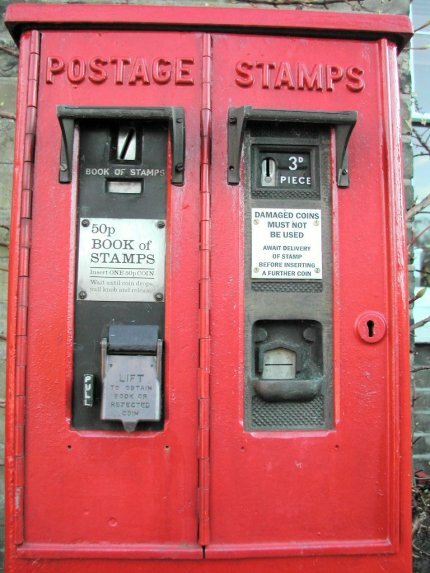 The first stamp vending machines were introduced under Edward VII in 1907 following experiments with a 1906 patented design by Robert J Dickie of New Zealand. The sales rights outside the British Empire were licenced to Kermode & Co. The A type vending machine was completely mechanical, deriving power to drive the vending mechanism from the insertion of a suitable coin. 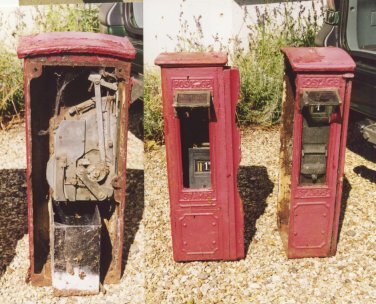 Initially the machines were set to dispense only half-penny and 1d stamps. These proved to be quite successful and were in continuous production until 1924, when the improved Type B machine was introduced. Type A machines feature elaborate cast brass fronts with the coin value raised against a chequer-plate design in the casting (Click to view a Type A machine). Type B could accept half-penny, 1d or (later) 3d coins and would in exchange, vend a single stamp from a coil with stamps joined vertically (IE head-to-tail). A number after the letter B denotes a particular pattern or variation in design for the machine. The coin value is indicated on a changeable metal plate near the coin slot as the value and coin size were now variable. Following quickly from the Type B designs came other combinations of coin-operated machine. In Type C, two half-penny stamps were issued in exchange for one penny coin, whilst in Type D, one 2d stamp is vended in exchange for two penny coins. These four types all work with long continuous stamp coils. In Type F, the machine is set to dispense booklets of stamps. These were introduced for machine-vending shortly before the outbreak of World War II and eventually came to be the predominant type in use. Booklets were first tried out in the Edwardian era and in 1935 a larger more elaborate design was used with mixed-value booklets of King George V Jubilee stamps in panes of four, interleaved with advertising. These Jubilee books were too large for machine vending at the time. This link will take you to Ron and Eunice Shanahan's site which contains an excellent essay on coil stamps and booklets with illustrations. This rare shot from Tickhill in South Yorkshire shows a Case C.I Type F where the coins pass down through the wall in coin chutes to a separate cash box at the rear, inside the building. These have been scarce for some years now. 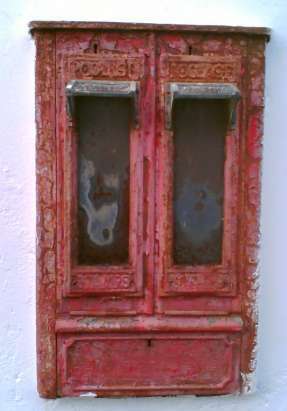 The doors are individually locked and hinge out and downwards for maintenance. Woodford Halse in Northamptonshire still sports this rather nice Case C.I Type K Mk.1. These cases have a separate cash drawer below the machines and use three separate No. 38 locks . The advantage over Type F is that no chutes have to be taken through the wall. The design also lent itself to pedestal mounting for the same reason. Another case CI Type K Mk1, this time in the sunshine of Clearwell in Gloucestershire. You can well see the hinges and the three separate locks. 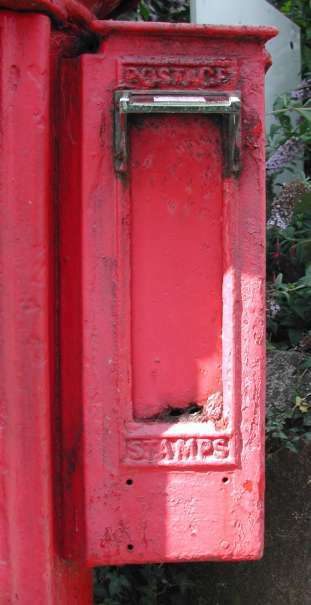 Normal practice was for Type B or C machines to be fitted dispensing half-penny and 1d stamps. 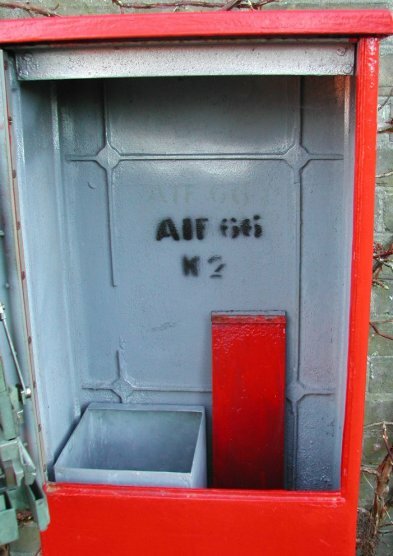 This case is still in the wall of Scarborough South Cliff Town Sub-Office and is painted black. The Type K Mk.2 has only one lock fitted (A No.32) instead of three. The machines are on one door hinged at the left with a central hinge between the machines. 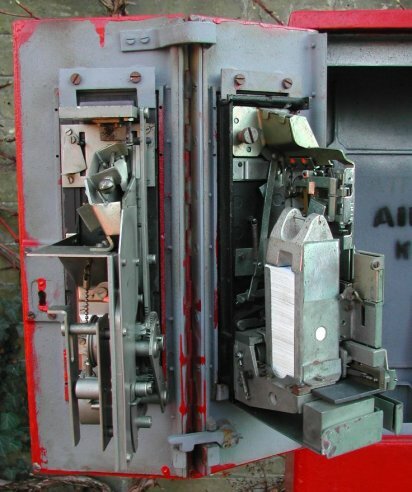 This is latched shut in the closed position but can be opened, as can be seen in the pictures below, to give access to each machine. 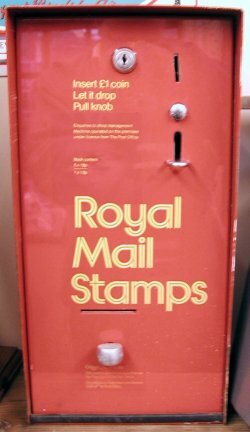 By 1970, there were some 50000 stamp selling machines in use in the UK and many more had been exported worldwide. The basic design remained unchanged from 1905 until 1970, when the Type G series was introduced. 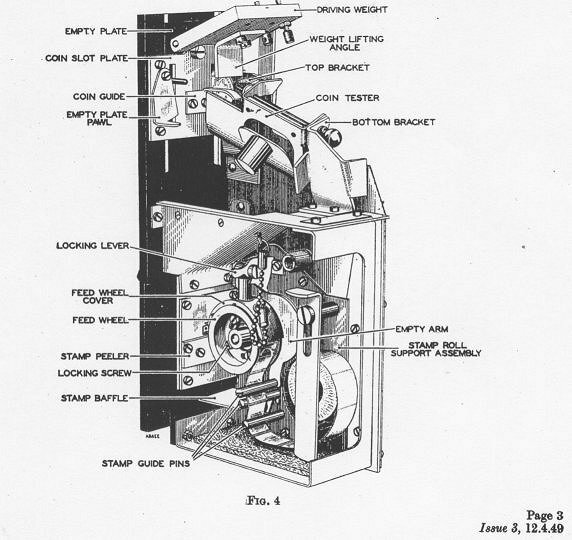 G.1 was the first modern mechanism and was said by the manufacturer to be designed to fit in the old housings, although subsequent to the prototype it had to be modified and in any case was much deeper than the preceding designs so that it actually required its own specially designed case, designated Type U. Type G machines incorporated many novel features including a Perspex cover sealed from moisture over the stamp coil to prevent the stamps sticking together. In addition the mechanism was driven by the user lifting a large flap over the vend slot. This action primed the machine. It could be set to dispense any number of stamps from one to five against the insertion of a single coin, although in practice this was never done and all Type G machines vended a strip of five values. Initially these added up to 1 shilling, then after 1971, 5 new pence and by 1980, 10p. 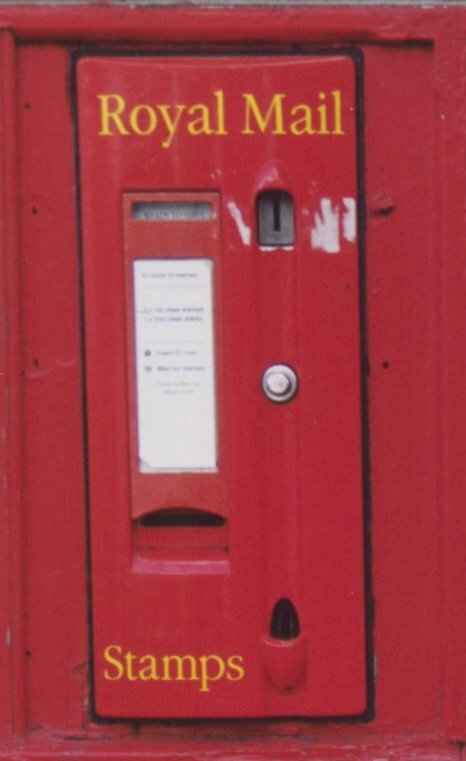 Changes in postal rates introduced in 1980 meant that all surviving 10p machines were withdrawn from service. Types A-E share the same common features that contributed to their success; they all have a stamp feed wheel with pins which accurately interlock with the stamp perforations and they all derive the energy needed to operate the mechanism from the raising of a weight through the insertion of a coin. Type F machines are different in that the coin releases a Pull bar which when pulled, forces the next booklet in a stack out through the vend slot. Such mechanisms as Type F and Type G are said to be coin-freed. This proved to be very successful and was used over and over again in subsequent designs of machine up to about 1988, when manufacture of purely mechanical SVMs ceased. From that time all machines in use in the UK were of the electro-mechanical type. This used a standard mechanical coin-weigher unit and mechanical stacking for booklets, but had an electronic arm on a rotating cam for dispensing the booklets. They were manufactured by Hillday Automation of Attleborough, Norfolk and designated Type B52. Two versions were built with either long or short coin boxes, easily recognised from the length of the case. 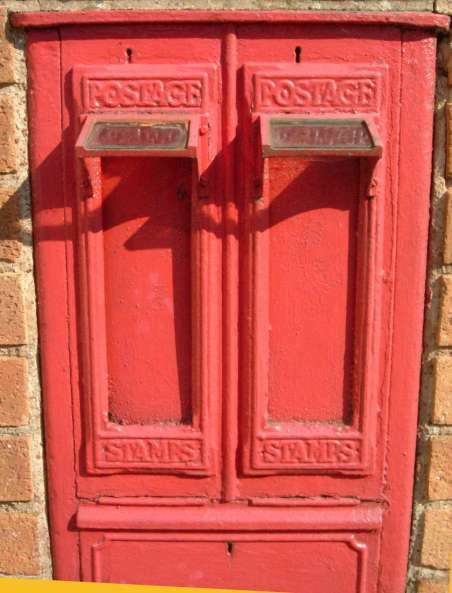 Initialy set to dispense 4 x 25p stamps in a folded booklet in exchange for a £1 coin, different combinations were later employed as postage rates in the UK continued to rise. These electro-mechanical machines were powered by large internal battery packs which made them expensive to service and more unreliable than the purely mechanical designs. All of these were removed during 2001 and today there are very few automated stamp vending machines left in use in the UK. As stamp booklets can now be widely purchased from supermarkets, garages, kiosks and newsagents, demand for automatic vending facilities has declined to the point where their continued operation becomes un-economic. In 1949, the GPO were issuing Type B4 machines in 1/2d and 1d denominations, whilst by 1958 a B4 3d machine had been introduced. P.O. Engineering Dept notice C.1003 was issued on 22nd September 1949 and details, with beautiful ink drawings, how the B4 mechanism works (see illustrations above). Notice C4111 details how to load it, whilst maintenance is covered by C5011 & C5164. In Notice C1505, detailing how to pack them for transport and dated 20th February 1963, the designs had progressed to B.4, C.4 and D.6 indicating that it took some time to perfect the two-coin vending machine. In these pictures of our own Allied Ironfounders (AIF) Case C.I. 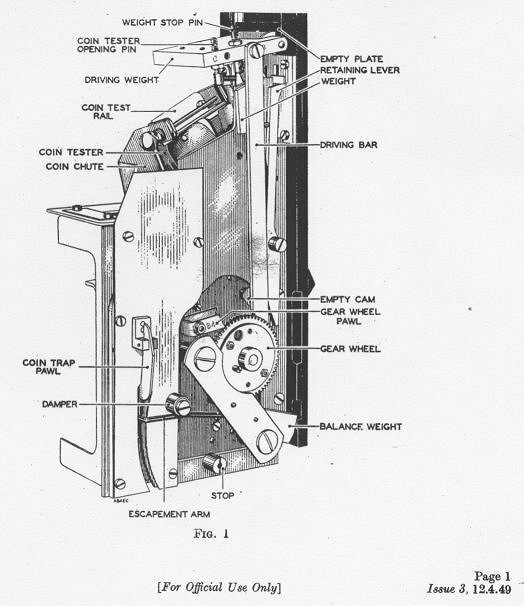 (Cast Iron)Type K Mk2, you can see how the two mechanisms are fixed and how the door is hinged. Notice also the metal cash box (there should be two) and the spare closure plate in case one machine needs to be removed. The mechanism are a 3d Type B4 coil vending unit (no coil) and a 50p Type F booklet vending machine. We do fit coils to this machine in summer when the atmosphere is drier. All of the mechanisms from A to F are designed to fit in the same mounting plates and cases. 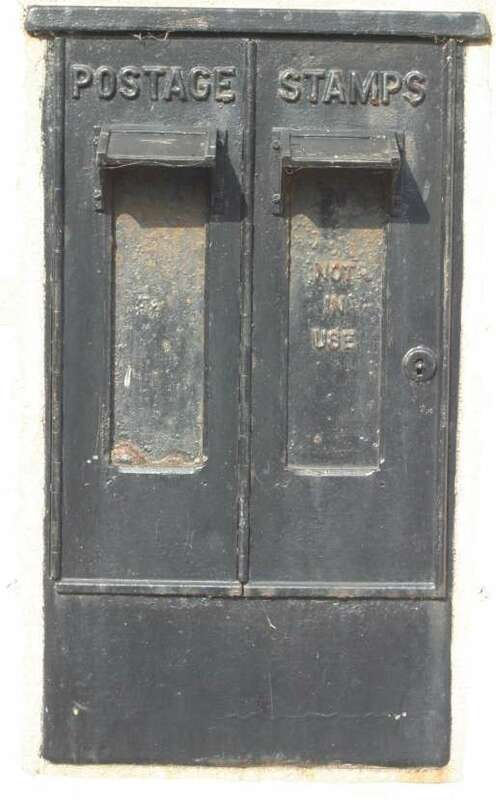 These were described in notice C1501 issued on 29th December 1936, which noted that the original brass mounting plates or cast-iron cases had by then been superseded. Case CI Type A for a single machine. Case opens from the front and hinges left to right. Case CI Type B for a single machine. Case opens from rear and door hinges down. Case CI Type F flush mounted to a wall for two machines, machines hinge out vertically downwards, coin chutes protrude down through wall to a separate cash box. Case CI Type G- was to have been a single unit case, but had not been made at this time. The same notice, EC1731, notes that Types H & J are now replaced by L and M for new installations. 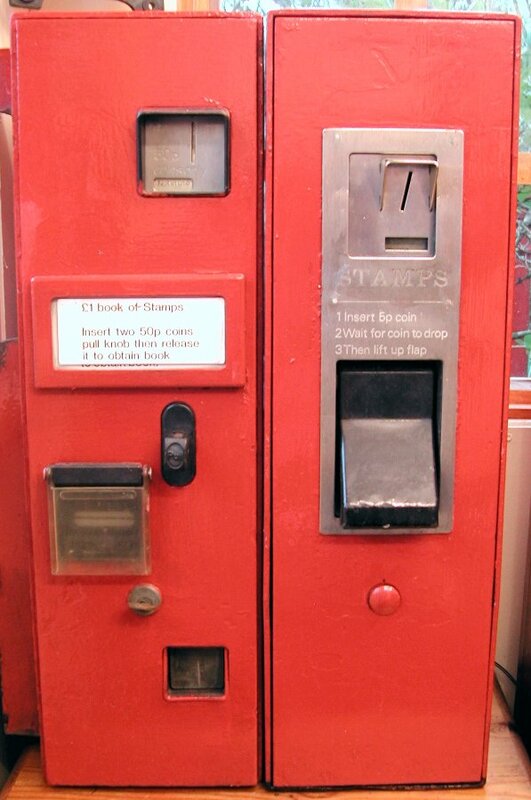 Case CI Type K Mk1 free standing or mounted in a wall for two machines side by side, no coin chutes, enlarged cash boxes which hinge open from front. In notice C1501 revised 25th July 1951 it is noted that K. Mk1 has been replaced by K. Mk2 which is now without a separate hinged flap for the coin boxes and sports only one door instead of two for the machines. These were made by Allied Ironfounders until at least 1966 and also by Carron Company. 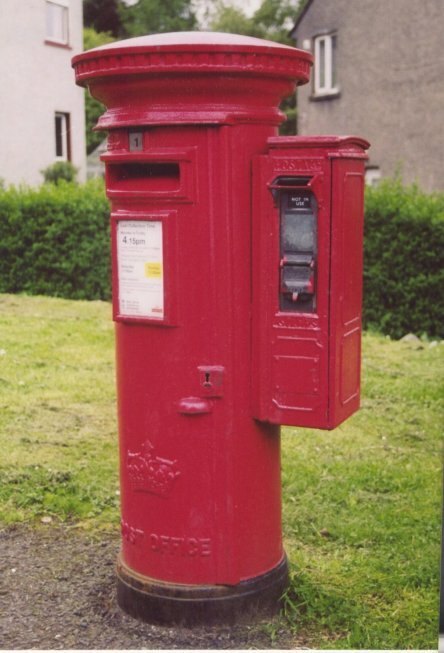 The 1936 notice also notes that machines are fitted into Pillar Letter Boxes of Types D or E (PB29 and 30) and Kiosk No 4 (TK31) although it does say that No more of these are being issued for the moment. In 1960, two authors published a slim tome entitled Stamps of Great Britain Issued in Rolls and the Machines which Use them by C.M. Langston and H.C. Corless which has an excellent description of the early history of stamp vending machines. Click here to read an updated extract from their book. These two machines were located on either side of the same pillar at Theydon Bois in Essex. They are Type M and Type Q cases and in the side view you can see the rather large cash tray. The mechanisms now fitted are Type B4 1d coils, but originally, one would have been for 1/2d stamps of the C4 type. Amazingly, these machines were still in-situ until 1999! They are now in collections in Hertfordshire and Essex (CVPHM). Another lucky survivor is this Type M located at Strathblane in Scotland. It was still extant when photographed by Chris Marcus of the LBSG in 1997. Since then a mass cull of SVMs by RoMEC has led to most survivors being removed. 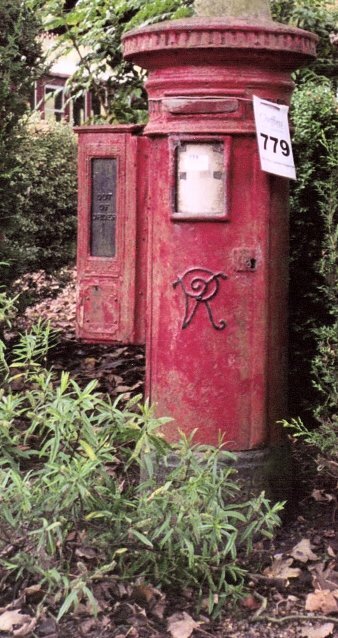 At the other end of the country is this extant Type J housing with the short coin box. It is in Teignmouth in Devon. The four holes would have carried an enamel plate of the type you can see fitted to our K2 cased mechs above. These normally tell users to wait for one coin to drop before inserting another (for Type D machines) and not to use bent coins (all machines). attached which records how many books have been sold. They are made by Hillday of Attleborough in Norfolk and designated Type B52. 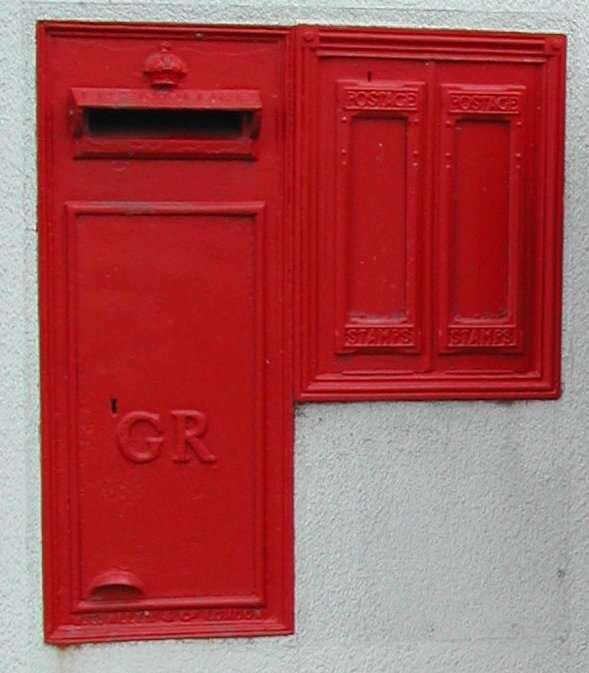 The Topsham example has an extended case with a large cash box whilst the Southsea example, being built into a Sub-Post Office, has no cash tray and thus is shorter. In the Museum we have a Case C.I. Type K Mk.2 by AIF and dated 1966 on the inside. It is fitted with a Type B4 3d machine from 1958 and a Type F.6 2s booklet machine of early 1970s vintage. Ours is actually adjusted to take old-size 50p pieces and vends any of the stitched or folded booklets of the 2s, 10p, 50p or one pound size. We have a Type E mounting plate which carries a cast iron Out of Order plate, used when the machines were broken or withdrawn from use and we have a cut down Type F housing, reduced to just one bay, holding a B4 1p coil mechanism. In addition we have two G.2 machines - one set for 5p and the other for 10p - one of which is in a Type U housing. Our Type H booklet vending machines are in Type U cases and represent both Associated Automation and Sterners built mechanisms, whilst our Hillday B52 (Type I or J??) has been restored to working order. In addition we have a small folded retail booklet vending machine for use in shops. Although this is a privately produced machine by Hillday Automation, it was authorised by Royal Mail and is finished in their livery. It takes £1 coins. Far Right: Our Case Type U is fitted with a Stamp Selling Machine Type G.1, dated December 1970, which is a Machin multi-value coil machine manufactured by Associated Automation of Harrow (now part of GEC Alsthom). This can be set to dispense a long strip of stamps which together add up to the appropriate coin value, in our case old-size 2s/10p coins. Introduced in 1970 (As G.1) and first used for l.s.d. Machin definitives in 1s strips of five, they were later adapted for 10p decimal strips (G.2) and again for higher values. All were withdrawn when the postage rate exceeded 10p in mid-1980. Above left: Our other Type U housing hosts a booklet vending mechanism of Type H from 1985 (Associated Automation). We also have the same type of mechanism made by Sterners in another U housing. Click the picture to see how the G1 mechanism is loaded with a decimal Machin coil. On the left is our Mounting Plate Type E. Right now it has a closure plate fitted, but we hope to replace this with another Type F SVM soon. On the right of this is a new arrival. Originally a two bay Case Type F wall housing this has been cut down to only one machine. It is missing the hood and restoration will continue as parts become available. The Hillday Type B52 SVM, which has just arrived at the Museum. Although the casting is a normal shape and size, like the previous Type U, these boxes are electronically controlled rather than purely mechanical. In some ways this was their downfall. The complex electronics could go wrong and the expensive battery packs are not rechargeable. 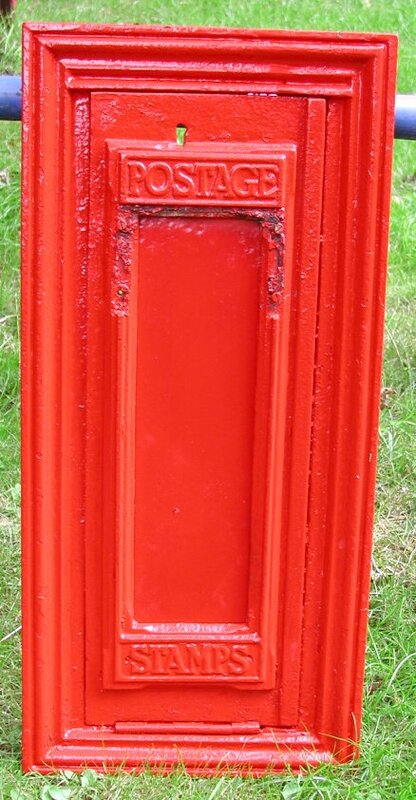 This is now fitted to our K-type pillar box.